The Workbook provides students with further opportunities to practice difficult grammar points, and to consolidate their understanding of related grammar topics. It offers a wide range of activities, which include opportunities to work with grammar structures in meaningful contexts. The Workbook also includes review sections for each group of units in the Student's Book. These groups, such as Present and Past, Modals, and Articles, are listed in the table of contents of each Student's Book. An edition with answers is also available.  extra practice for difficult grammar points.  allows students to consolidate what they have learned in groups of units in student book.  expands on range of exercise type used in student book, offers a greater challenge. 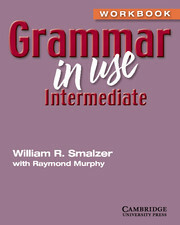 The second edition of Grammar in Use: Intermediate contains nine units of new material, more exercises, and a free Audio CD with recordings of example sentences. Two entirely new sections have also been added: Additional Exercises, which give students the opportunity to consolidate what they have learned; and the Study Guide, which helps students to check which units they need to study. 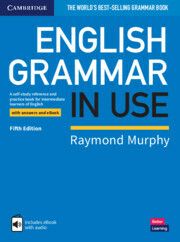 Grammar in Use: Intermediate is suitable for students who are preparing for the TOEFL® and other standard examinations. The workbooks provide students with further practice opportunities.